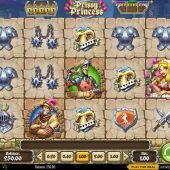 Prissy Princess slot is a differing design from the usual issued by our Swedish slot specialists from Stockholm! The background is an enchanted medieval castle and the reels are backed with the stone blocks of its construction. Gentle medieval pipe and lute music underscores the game which has 20 pay lines over 5 reels. The reels themselves have a new take on the 'Rolling Reels' or cascade-style slots too - instead of merely the winning combinations disappearing, the whole reel does so for example a 4 reel pay will see all those 4 reels replaced by further symbols. The icons are various medieval characters such as the princess, Knights and various shields and weapons, much in the same style as Medieval Money from IGT. There are surprisingly no scatters on the reels! That's due to features being cumulative via a locks and banner counter above the reels; there are Princess Wilds on all reels though and Dragon Wilds can appear being either random or created by certain symbols on the reels. Should you see 3 of any Knight form a whole 3 rows on any reel, it will turn into an expanded Dragon Wild for that spin. The Dragon may also fly across the reels and change up to 3 symbols into Wilds by directing its fiery breath at them! The pays are weighted towards the 4 or 5-of-a-kind combinations of which 5 Princess Wilds is the highest at 50x stake, the Knights are 15x stake and lowest weapon or armour icons are 2x stake for 5. The smaller wins though are very small, can be as little as 1/10 of a credit for a 3-of-a-kind! When considering this, bear in mind that consecutive wins can occur through the Rolling Reels mechanism. There are two bonuses possible via the cumulative rolling reels. Firstly if you collect 3 pennants during successive cascades then you unlock the Tournament Game above the right of the reels. You will pick a winner in a succession of various medieval sports such as jousting and archery, and will be in an enchanting world of outdoor activities with quite breathtaking graphics! The maximum win you can attain is 200x stake should you become the Medieval Olympic Champion. Five successive reel wins will open the 5 padlocks above the left of the reels. You will then see the contents of the Treasure Chest Bonus which will award a win of between 3 and 100x stake or a 2, 3 , 4 or 5x multiplier on the cumulative wins that led to its unlocking.